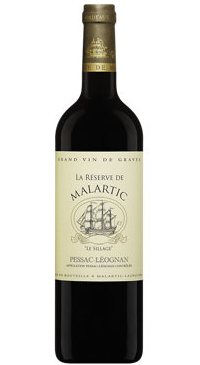 Château Malartic-Lagravière was one of only six properties in Bordeaux to enter the 1953 Graves classification for both its red and white wines. It is located on a high terrace that has been deeply etched by the Eau Blanche stream and its tributaries. It sits on 8-meter-deep deposits of gravelly soil. The name of ‘Lagravière’ points to the fine gravel soils of this vineyard that make for excellent surface drainage while below the shell-rich limestone sub-soil, made up of fossils from warm seas and veins of clay, store large amounts of water. 45 % Cabernet Sauvignon , 45% Merlot, 5 % Cabernet Franc and 5 % Petit Verdot. The colour is a bright deep crimson with hints of violet. The nose is intense and complex with black fruit and morello cherries and a delicate, elegant woodiness. The palate is fresh with power and elegance; flavours echo the aromas and the wood character is beginning to integrate and make way for more flavour development. Impressive nose with leather, dark polished fruit and flowers. Wonderful mouthfeel with soft silky tannins and beautiful texture. Really well put together. Powerful and rich with loads of fruit and ripe tannins.